Beautiful semi-oceanfront home, Crabcake will have all you need for an unforgettable vacation. Located in Corolla in Ocean Sands, 8 bedrooms, 7 1/2 baths, private pool (10 x 20) and hot tub, outside shower, grill, rec room with pool table, theater room and WiFi. Great for family, friends and reunions. Community pool and tennis court are also available. 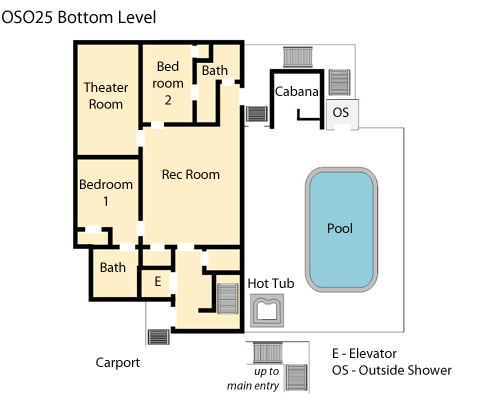 All bedrooms have a TV and Blu-ray player, theater room with 106 inch projection screen and Blu-ray player, Cabana by pool with TV and refrigerator, Rec room with 55 inch TV, and outdoor speakers on pool level and top level deck. Watch a video of the elevator's beautiful mural, and the top level living area and view! The weather was great. The few problems we had with house were taken care of quickly. We all thought all the remotes and electronics were a little confusing. We loved the Media Room. Wish we had thought to bring more DVDs. The house was great. Could see ocean from top deck. We had a fabulous week at Crabcake! The home was so comfortable and the great room on the top floor was fabulous. We had 12 adults, 6 kids and 3 babies in our group and the house fit us all comfortably. Highlights were the theater room, elevator, closeness to the beach and our own pool. Having access to the community pool and tennis courts was a bonus we enjoyed more than we expected. Had some confusion checking in with housekeeping issues but we were very impressed with the quick response and efficient problem solving by Village Realty staff. Other minor suggestions would be to have better icemaking capability, more wine glasses and plastic cups for around the pool. We highly recommend both Village Realty and Crabcake! Loved the house. Perfect for all of us and very convenient to the beach. This trip was almost a year in the making and did not disappoint. The bedrooms were large and accommodating. The upper deck was beautiful. Some suggestions:instructions for electronics. Bucket and mop. Some of the chairs in the theater room do not recline. The area surrounding the pool seems unfinished as compared to some other homes. Also allows for dirt and sand to be tracked everywhere. VR met our expectations again with quality and responsive service with a friendly and professional staff. The home was a dream come true and my family was thrilled with our "home" away from home. Top items: The 3rd floor ocean view and family living space with kitchen, the # of bedrooms, the beautiful, stylish decor, the top notch movie theatre room/seating, and the high quality TV'S with a variety of channels in all rooms. 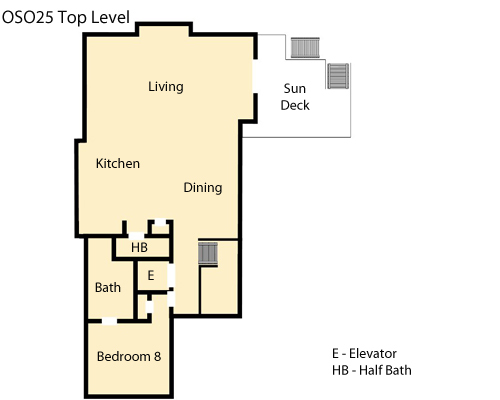 To improve/comments: Add hair dryer, need outdoor lighting by hot tub and surrounding area, more lighting on bottom deck, oven mitts, and printed instructions on how to operate TV'S and movie theatre equipment. The WiFi was not working properly during our first few days, but the Internet company resolved it. Our family was impressed with the cleanliness of the property and how well it was maintained; like new. The elevator was appreciated by my senior parents. Hope to return in the future when the pool is open. In short, grade A.